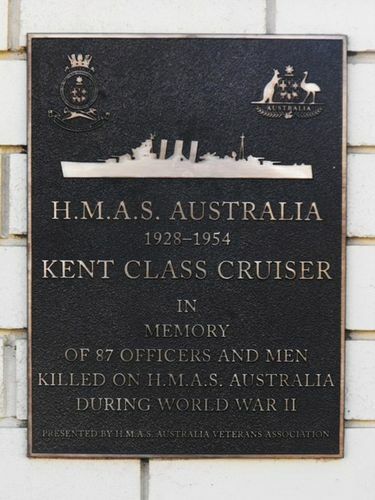 A plaque commemorates the 87 officers and men who were killed on HMAS Australia II during World War 2. In early 1942, with Japan now at war with the Allies, Australia was flagship of a small task force assigned to protect the south Pacific eastwards from Australia. In that capacity she engaged enemy aircraft in May, during the Battle of the Coral Sea. In August, she participated in the Guadalcanal Invasion. Thereafter, she mainly served as one of the heaviest ships involved in the fight for New Guinea, initially in a covering role. Beginning in late 1943, with the landings at Cape Gloucester, New Britain, Australia provided fire support and surface ship protection for the assault across northern New Guinea. On 8-9 June 1944, she was flagship of the task force that pursued Japanese destroyers off Biak. Australia later participated in the Leyte invasion in October 1944 and the landings at Lingayen Gulf in January 1945. She was hit by a Japanese plane in the former operation, losing some twenty of her crew. No less than five Kamikazes struck her during the Lingayen operation, taking the lives of over forty crewmen, but she remained on her gunfire support station until no longer needed. Prior to her deployment to the South Pacific in 1942 , Australia saw service in the Indian and Atlantic Oceans.